Your baby is turning 1! Now that's a reason to celebrate! Our First Birthday Candy Bar Wrappers and Candy Bar Favors are just what you need to make your baby's 1st Birthday as SWEET as can be. Everyone loves chocolate! Our Personalized Chocolate Bars come complete with your child's name, date of party, and any other wording you like. They are sure to make a delicious addition to any 1st Birthday Party celebration! 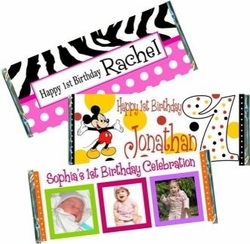 Our Birthday Candy Bar Favors and Candy Bar Wrappers are very popular 1st Birthday Party Favors! They're inexpensive, festive, and fabulous! Candy Bar Favors are an inexpensive way to thank your guests for celebrating your baby's First Birthday. We offer FREE foil sheets, FREE customization, FREE Personalizing and will add a photo to your 1st Birthday Candy Bar Wrappers FREE! There is no SWEETER way to thank your guests than with a delicious Personalized Candy Bar Favor. A baby's First Birthday is such a special occasion, you need a special Party Favor! A delicious chocolate bar wrapped in a festive First Birthday Candy Bar Wrapper is just what you need. Your guests will love our Candy Bar Favors and you'll love handing them out! Order the 1st BIRTHDAY CANDY WRAPPERS ONLY. We provide the SILVER FOIL underlay and PERSONALIZED WRAPPERS! *This is a DIY project. We do NOT provide the Hershey candy bars!! *Our wrapper/foil combo will fit 1.55 oz "Regular" Size Hershey's® bars! *Assembly is required by customer *To sum it up: YOU buy the chocolate bars, YOU wrap bar with silver foil provided then wrap with your adorable personalized wrapper. Order the fully WRAPPED CANDY BARS. We will do the work for you! Your 1st birthday favors will arrive to you all ready to hand out to your guests. We can add a photo to any of our wrappers! If you would like us to add a "photo" to your Candy Bar Wrappers, please send your photo & order number to info@candyundercover.com.